The government has allowed a South Korean delegation of athletes and staff to visit North Korea for an international youth soccer tournament set to be held next week. The Unification Ministry said on Wednesday that the 151-member delegation includes soccer players, staffers and reporters. 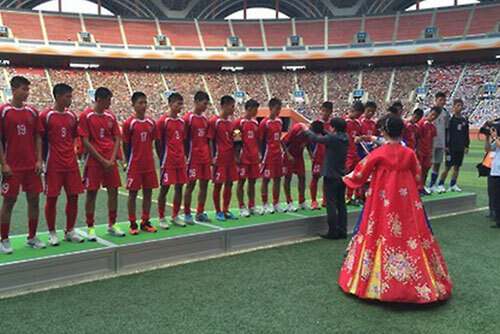 Co-hosted by the South-North Sports Exchange Association and North Korea's April 25 Sports Club, the fourth Ari Sport Cup tournament for under-15s will take place in Pyongyang from August 13th to 18th. The delegation will head for the North on Friday and return home on August 19th. It represents the first time for such a large group of South Korean civilians to visit North Korea via an overland route since the Moon Jae-in government took office. Eight teams from six countries, including the two Koreas, Russia, Belarus, China and Uzbekistan, will compete in the tournament.